So many individuals and families keep seasonal homes in pretty rural areas—the better to enjoy even a small part of Canada’s rich and vast natural beauty! But there is nothing fun about arriving at your seasonal cottage in anticipation of a fun vacation only to be laid low right away by seasonal allergies, mould, mildew, dust, and other common allergens. Unfortunately, this is all too common as both outdoor and indoor air quality worsens across the globe. 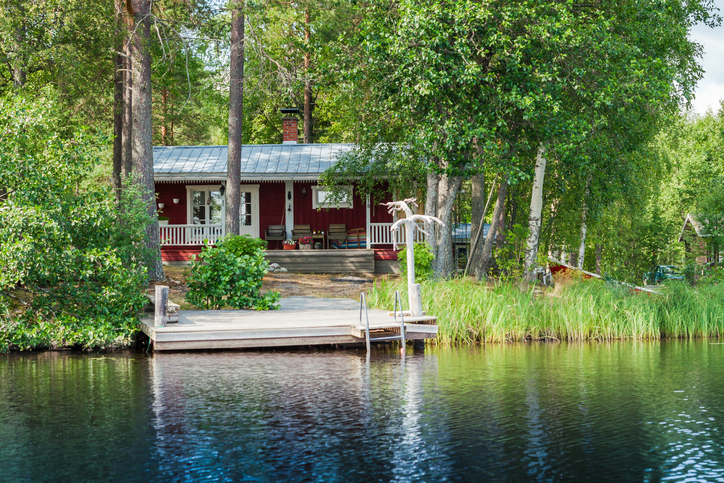 Luckily, here at Clean Air Solutions Hamilton, we have both the expertise and the resources to help you enjoy cottage season with minimal interference from airborne toxins. Read on for our favorite timely tips and learn how to stabilize and purify your indoor air at your seasonal residence. It’s true that there is no solution to the spring pollen floating around outside. Whether you’re in a densely populated urban area or an isolated rural situation, there is plenty of pollen being made and released right now! However, pollen on its own is just part of the challenge that your immune and respiratory systems face when you head to your seasonal cottage. For example, when you’re reopening your cottage, you may use commercial cleaning products to tidy up after a long winter away. You might then light up some incense or a candle or use air fresheners to freshen and scent the stale air. After you’re finished with all your cottage reopening chores, you probably jump in the shower or tub and use a selection of personal care products to clean up after all that work. And at night, as a part of your natural cottage experience, you may decide to cook on a woodstove or gather around your fireplace on chilly evenings. While it is still far from common knowledge at this point, these types of indoor activities can actually release a concentration of airborne toxins that far exceeds anything nature can generate. The cumulative effect is that indoor air that is up to five times more polluted than any smog you might find outdoors. As more information is released about how toxic our indoor air is becoming, there is more public demand for protective indoor air quality aids to clean and purify the air in our homes and cottages. Since you want to stay healthy when you’re off work and vacationing with family and friends in nature, these indoor air quality aids can be especially appreciated at your seasonal cottage. While it is good news that there are efficient ways to clean your indoor air, it is even better news that the majority of today’s indoor air quality aids are also quite affordable and low maintenance! The specific indoor air quality equipment you choose will depend on the type of air conditioning and heating system in your seasonal cottage. There are two basic types: ducted and non-ducted. For ducted systems, we always recommend retrofitting your HVAC system with a heat recovery ventilator. This highly efficient, effective unit works with any type of HVAC system to separate incoming fresh air from outgoing stale air and keep indoor humidity levels balanced (which also means no mould or mildew). We also recommend either a HEPA air filtration system or a UV air purification system. Either system can be installed to work with any type of HVAC system and either will work beautifully to keep your indoor air toxin-free. The HEPA filtration system filters out minute airborne toxins from your indoor air. The UV air purification system neutralizes these same airborne toxins with the help of UV-C, the most potent form of ultraviolet light. The system you choose often boils down to personal preference, as either approach offers an efficient, effective, low-maintenance and long-lasting way to clean and detoxify your indoor air. For non-ducted systems, we recommend a portable version of either a HEPA air filtration system or a UV air purification system. These are portable versions that can work to filter or purify the air in smaller spaces that don’t have any existing duct work. Indoor air duct cleaning is becoming more common and popular in homes and businesses today. But it is still relatively rare among seasonal cottage owners. However, if your seasonal residence has a ducted system, it is highly likely your air ducts are harboring a wide variety of trapped toxins, especially as local critters and insects find their way inside to escape winter weather! The beauty of a professional indoor air duct cleaning is that it takes less than half a day to complete from start to finish and it leaves your indoor air ducts squeaky clean, sanitized and essentially brand-new! Many clients tell us they can actually smell the difference after an air duct cleaning—that is how clean their indoor air becomes!